Home » Service Manual Catalog » EPSON Service Manuals » Laser Printers » SM_EPLN2120 I have paid for Reset Key but not received yet. I have been struggling with a clogged head on my Epson Pro 4900 for weeks. The Windex-on-a-papertowel-overnight solution has worked before; however, it was not clearing the nozzles this time. Thanks to John\'s link ( http://forum.luminous-landscape.com/index.php?topic=77073.0 ) for guiding me to 2manuals.com!! I purchased the SP4900 program and it was GREAT! I used the Adjustments (Individual) program on Section 2 Head Related Checks and Adjustments, first at level CL3 then CL2 for the clogged colours channels and voila, my head is now fully functional again. I have only browsed through the other SP4900 subroutines, but they will provide me with a full suite of maintenance routines that could be very useful in the future. This program was fantastic. The only inconvenience was that it is a Windows .exe file and I am a Mac OSX user. 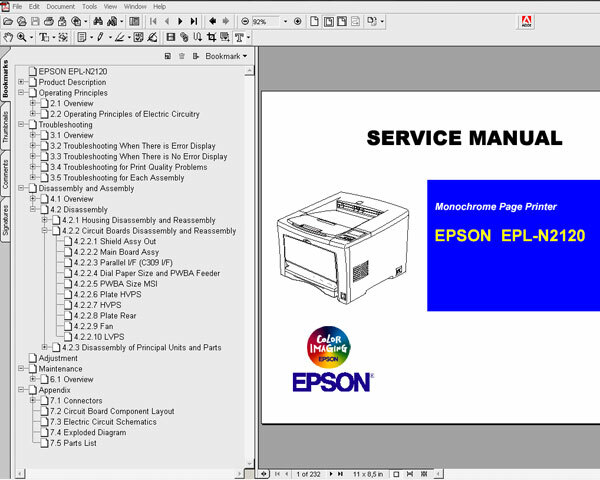 I had to launch Windows 7 Pro in Fusion and conduct the maintenance; however, with so many Mac users needing this type of help for the Epson Pro printers, it would be great to have an OSX program option too. That being said, if you can run Windows on your computer and have an Epson Pro 4900, I highly recommend this indespensible program. At $29.99 it is a steal compared to calling in a technician. Keep up the super product support, John!! Thanks.